Windows has always been a great environment for multitasking, with the ability to run multiple applications at once and to switch between them with relative ease. In Windows 10, Microsoft tightened up the snapping mechanism and expanded its functionality. Today, the latest version of Windows 10 offers a number of ways to split your screen into multiple windows and get real work done, with better support for higher resolution displays and multiple monitors. Step 1: Choose the window you want to snap to one half of the screen, then drag it to the edge. Step 2: A translucent outline of where it will snap to will appear. If you’re happy with it, let go and your window will be snapped into place. Alternatively, press the Windows key and the left or right arrow key to snap the last selected window to one side of the screen. Step 3: If you have other windows or applications open, when you snap your chosen window, you’ll be presented with a number of options for what to fill the other half of the screen with. Click on one, and it will automatically snap into place opposite the other window. Once you’ve placed your windows, you can easily resize them by dragging the divider. There’s a limit to how thin a window can be, though, to help you avoid creating windows that are so small that they’re useless. If you have a large, or high-resolution display, you can take advantage of all of that extra screen real estate by snapping more than two windows. Corner Snap, as it’s known, lets you snap into place as many as four different windows. Step 1: Drag and drop your first window into the corner you want to snap it to. Alternatively, press the Windows key and left or right arrow, followed by the up or down arrow. Step 2: Do the same with a second window on the same side and you’ll have two snapped into place. Corner Snap is then activated, and much like when snapping just one window, you’ll be given the option to fill the empty space with a third. Step 3: To bring the fourth window into play, drag the third window into the corner and then select another application from Snap Assist to complete your four-window setup. If Snap Assist is getting in your way, then you can turn it off easily enough. Step 1: Search for “Settings” in the Windows search bar. Click the corresponding entry. Step 2: Select the “System,” icon, then click “Multitasking,” from the left-hand menu. 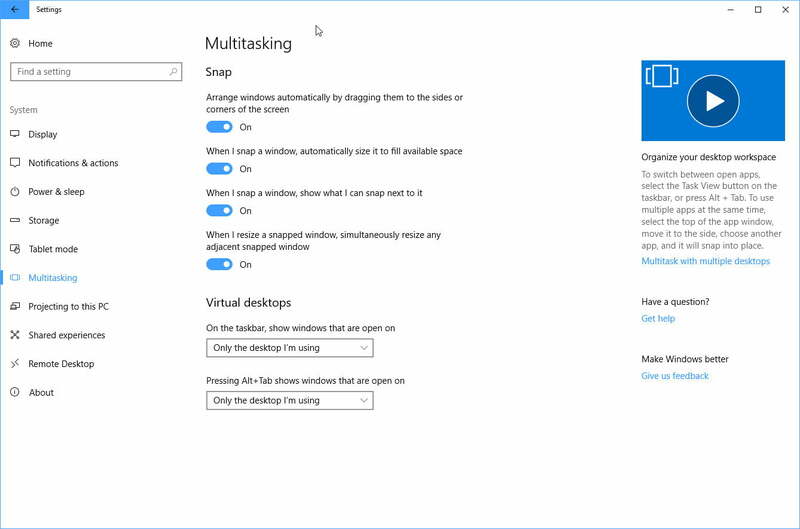 You can toggle a few settings here, including turning off Snap Assist by toggling “When I snap a window, show what I can snap next to it.” Other settings that you can adjust include turning Windows 10 Snap off completely, deciding whether windows should automatically adjust to fill the available space, and whether adjacent windows are resized when you resize a snapped window.